I started occasionaly adding coffee smoothies into the rotation this summer. So far I’ve found some delicious (coffee and coconut milk, wonderful), and some terrible (coffee and flax = devilish bitterness) combinations. First things first though, a good solution for cooling freshly brewed coffee. 1.) Brew coffee as you normally would for one – two cups. 2.) 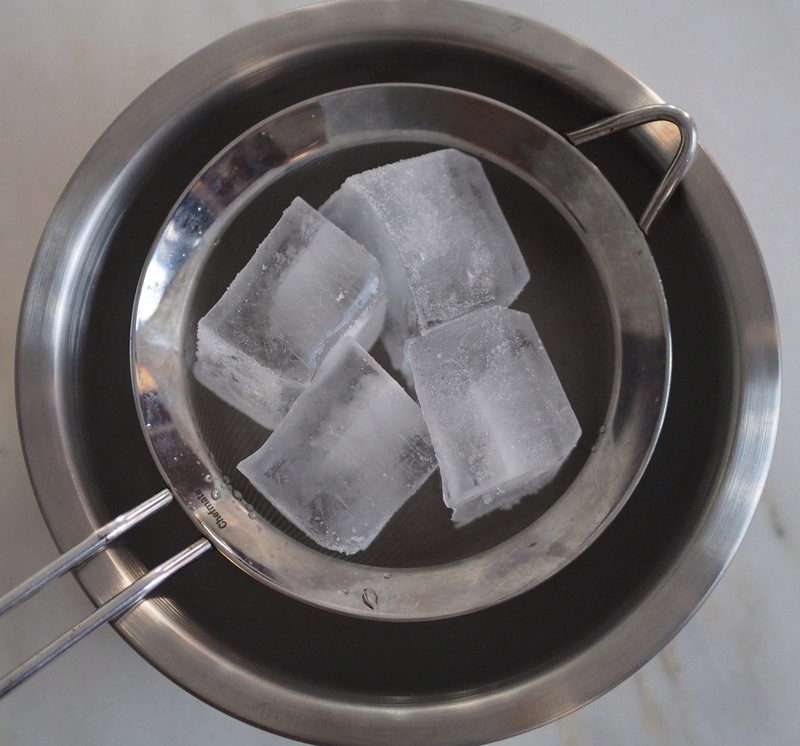 Place large or several ice cubes into a mesh strainer. An abundance of ice is necessary because as we’ll be pouring hot coffee over the ice, the quantity ensures that all of the liquid will become cooled. Set or hold the strainer over a small metal bowl. Note: while both bowls shown here are metal, the important one to be metal is the smaller one – it will best transfer the cold of the ice water to the coffee. The larger bowl may be metal, but it doesn’t have to be. Leave the double-cooler to the side as you assemble your other ingredients, set up your blender, get a glass ready, tidy up. Adding the chilled coffee to the smoothie will be your last step before blending!